Katya Pronin is a photographer and ENL teacher. She received a Masters in Applied Linguistics and Teaching English to Speakers of Other Languages in 2003. Her first three years as a language instructor were at a public high school, Lower East Side Preparatory School. Following that she wove language studies into design and theory curriculum at Parsons School of Design. In 2007 she took a hiatus from teaching in order to study photojournalism at the International Center of Photography. She returned to teaching a few years later, incorporating a creative curriculum in a variety of classrooms, from college preparation for foster children to listening and speaking classes for newcomers. In 2016 Katya partnered with her longtime friend, Liz Eckert, to create a workshop series that would help empower non-native English speakers through supporting and enhancing their systems of self-expression. Beyond Fluency has been offering foundational and storytelling workshops both independently and at HB Studio. 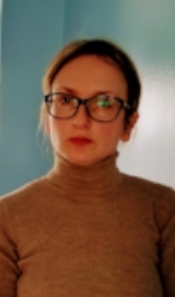 Katya also currently she teaches Academic Writing and Language Skills at Parsons School of Design and Communicative Skills at the United Nations.